Besides vintage electronics, I have been addicted to vintage cars and particularly FSJs (Full Size Jeeps) that were available from 1963 to 1991. My 1982 Jeep Wagoneer was my first conscious car purchase made with my own earnings. 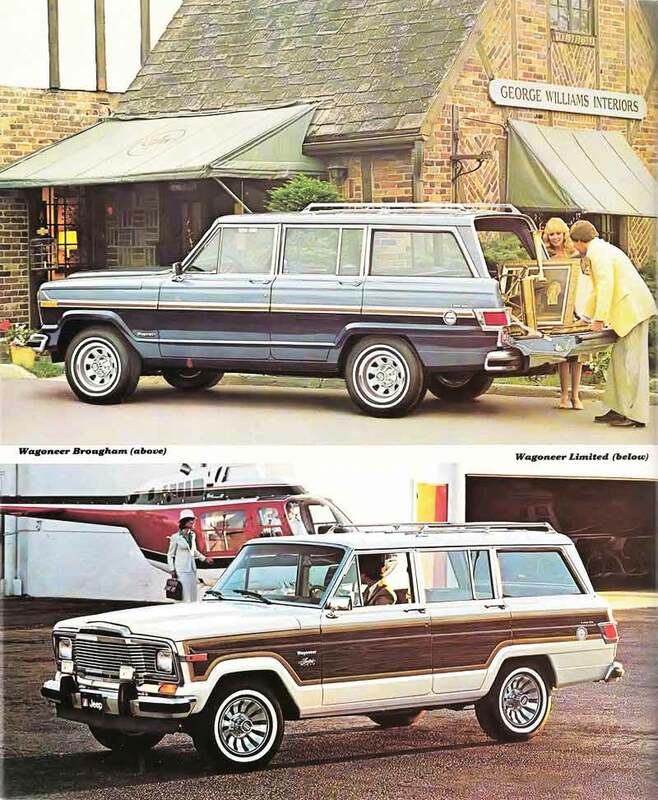 The Wagoneer was not a hand-me-down or a present from the parents like my prior vehicles. The Wagoneer stands out to me as a timeless design that thrived through three decades with little modification under multiple marques including Willys, Kaiser Jeep, AMC, and Chrysler. The FSJ lineup was a rare success in the automobile industry that typically redesigns their models every 5 to 10 years. Another key distinction was the luxurious interior unheard of in a 4x4 back then. Why a FSJ you might ask? I had a practical need for a SUV to be able to haul around stuff occassionally. Since the SUV did not have to be a daily driver, I was willing to own and maintain a classic vehicle that isn't confined to the role of a garage queen and fulfills my practical needs. An added bonus with classic vehicles is that they generally retain if not appreciate in value. The general assumption is that you do most of the repair work yourself or costs can easily skyrocket. When I thought of a classic SUV, the Wagoneer was the first to come to mind despite me having never seen one in person before. I had seen the 2-door Cherokee in person once back in high school but I was not in the position to consider buying it then. 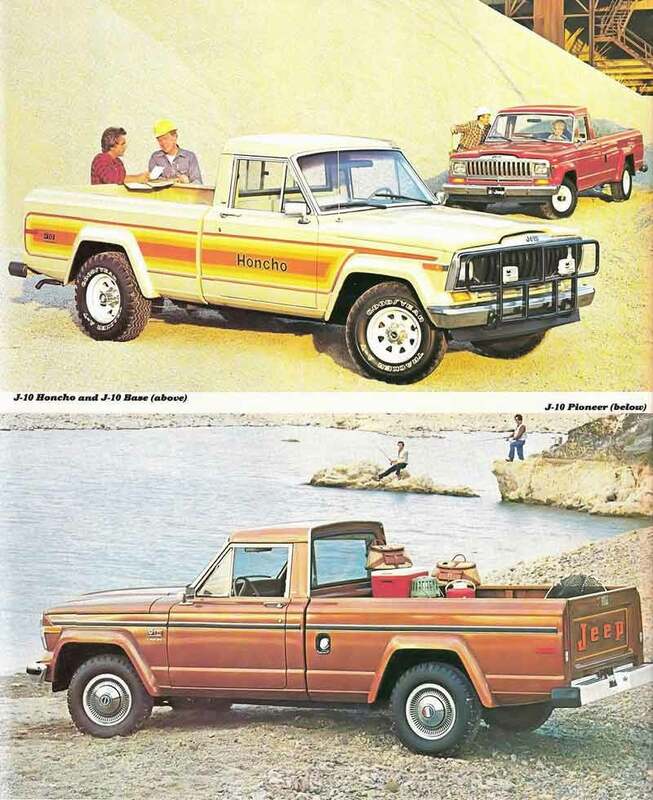 I also suppose I grew up watching plenty of TV shows and movies from the 1970s and 1980s featuring Wagoneers or J-series trucks that had a subliminal effect on my mind. 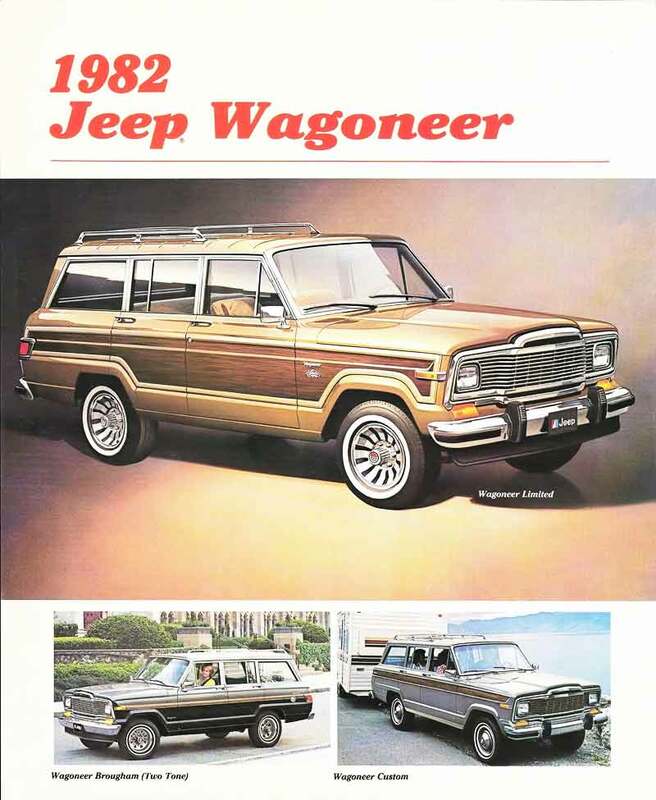 I even continue to notice Wagoneers featured in brief scenes of various TV commercials, shows and movies today. Finally, another reason I was interested in FSJs is because they were one of the last vehicles built in the 1980s to 1990s whose engines were still equipped with a carburetor while other manufacturers had moved on to fuel injection. I wanted an opportunity to learn how to work on automobile engines because my prior experience was being self-taught with small 1-cylinder lawn mower and go-cart engines. To me, carburetors are relatively simple devices to understand and easy to manually tweak compared to fuel injection involving electronic adjustments and mapping. I appreciate taking the time to understanding the original mechanical and simpler solutions first despite their limitations and drawbacks before diving into complicated and advanced solutions that led to modern engines. Also FSJs built by AMC shared many common parts with other AMC vehicles and are mostly interchangeable across decades so parts are relatively easier to find. This page is intended to showcase pictures of my FSJs and document various information and technical notes that may be useful to other fellow FSJ owners. Be aware that I am not a formally trained mechanic. I'm self taught from plenty of reading including the factory service manual and various forums. You can find links to write ups on different topics for each FSJ below. 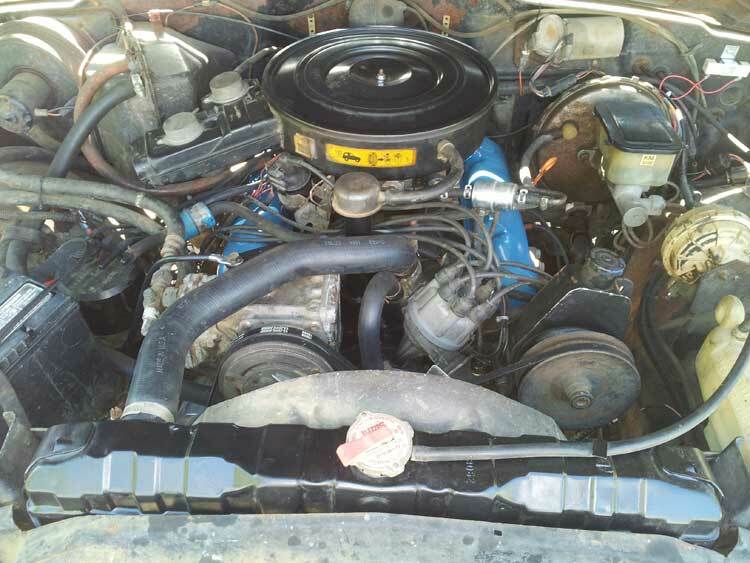 This 1982 Wagoneer was purchased in December 2010. The previous owner had it for about 7 years but he was not a mechanic himself so he had a lot of shop work done on it. 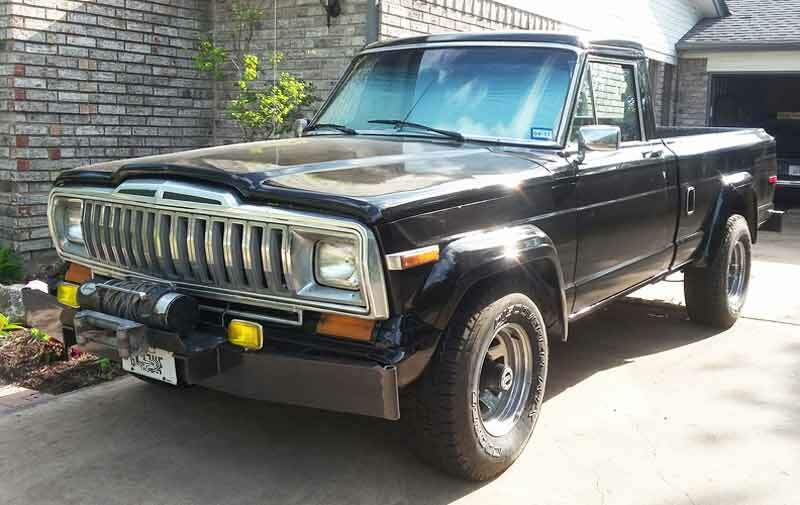 I had test driven several Wagoneers prior to this one hoping to get an idea of how far a low end budget would go. 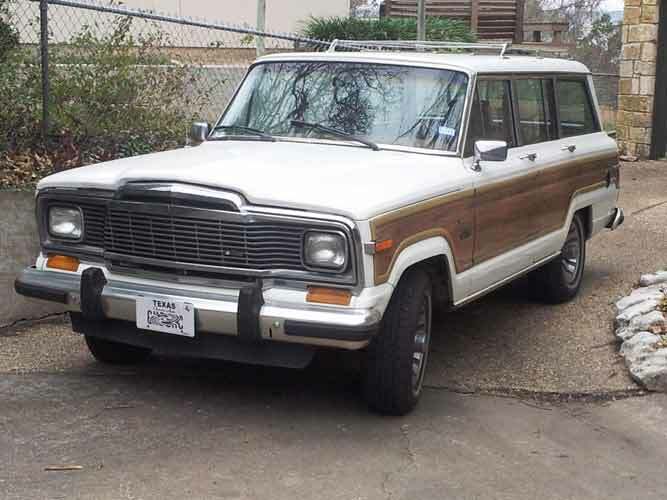 All of the unrestored Wagoneers would require TLC for various reasons. Some chugged around like a go-cart, some had gutted or ruined interior, and others had obvious mechanical problems. Then I drove the one I ended up purchasing. Engine purred like a kitten. Smooth acceleration. 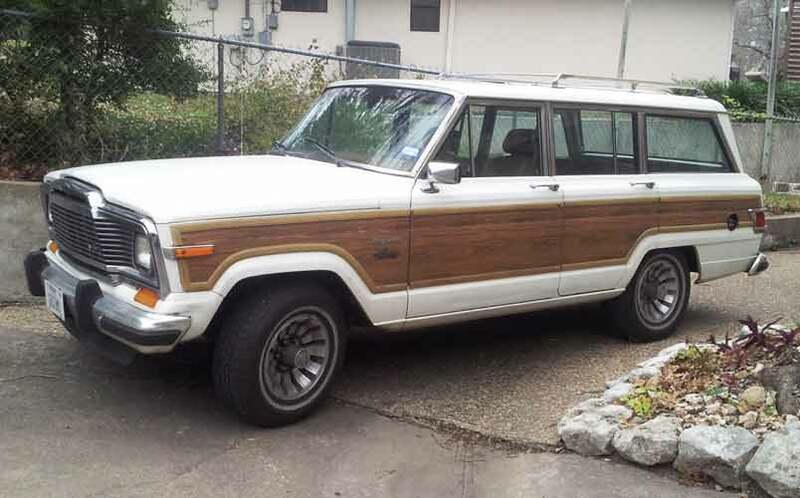 I was quickly convinced the owner was truthful about the engine and transmission both being rebuilt despite selling the Wagoneer at a relatively low price. For the 1982 year, there were 3 trims available. Custom, Brougham and Limited. This one I have is a Limited edition. 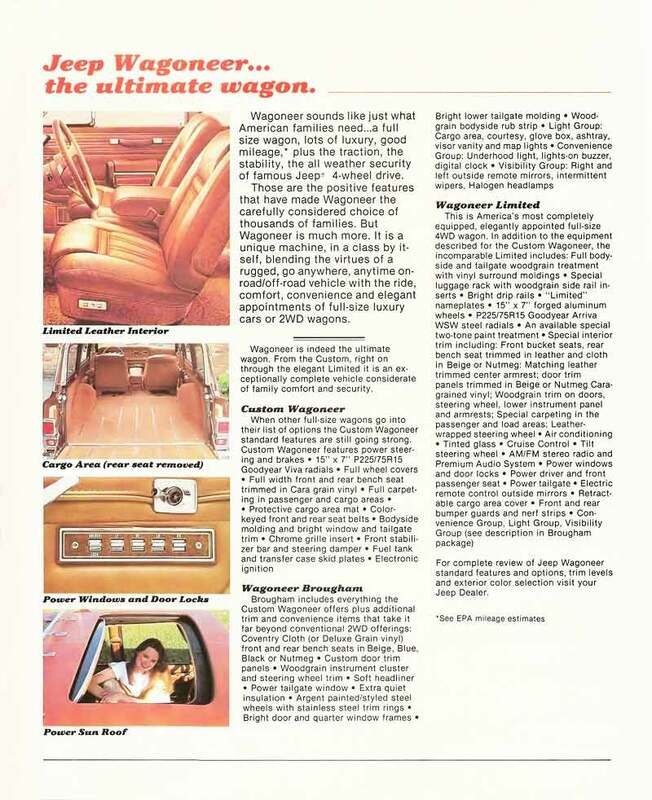 Courtesy of oldcarbrochures.com are the following brochure pages for the 1982 Jeep Wagoneer. The Wagoneer I had purchased had the interior in pretty decent condition with the original plush shag carpeting, nutmeg color interior, but unfortunately the leather seats were sun baked and cracking. Headliner had been replaced by the previous owner and looked good. The door panels were in decent condition with no components missing. The original A/C - very important in Texas! - was all there although the compressor was seized and disconnected. The brakes were nearly non-existent and laughably the previous owner explained it away stating that it is a "heavy 3 ton vehicle and that's how it is." I strongly doubted that putting all my weight on the brakes and bending the driver seat frame in the process was considered normal. The previous owner was probably in his early thirties so I don't think he ever drove one brand new to know what "normal" was. I cannot say that I have either, but I imagine no upscale customer buying these Wagoneers brand new then would expect it to be normal to have weak brakes. Nevertheless, brakes are an easy fix compared to rebuilding an engine. This Wagoneer was in good condition so there was not a lot of work required that was worthy of a write up. What was done includes replacing weatherstripping, minor electrical work, replacing the faux woodgrain siding, carburetor tuneup, simplifying the vacuum routing and installing keyless entry. 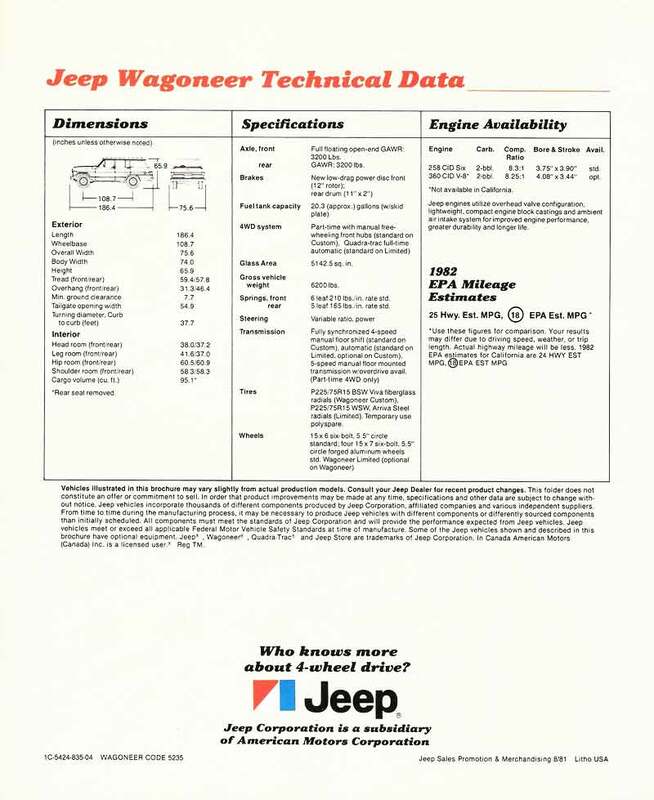 Many write ups under the J10 write up section below are relevant and applicable to the Wagoneer. I had been using the Wagoneer as the workhorse for several years hauling around stuff including bags of mulch, tree trimmings, lumber, and tools. After transporting a large tiller and the engine spilled oil on the carpet, I realized the need for a truck to avoid damaging the nice plush interior of the Wagoneer. 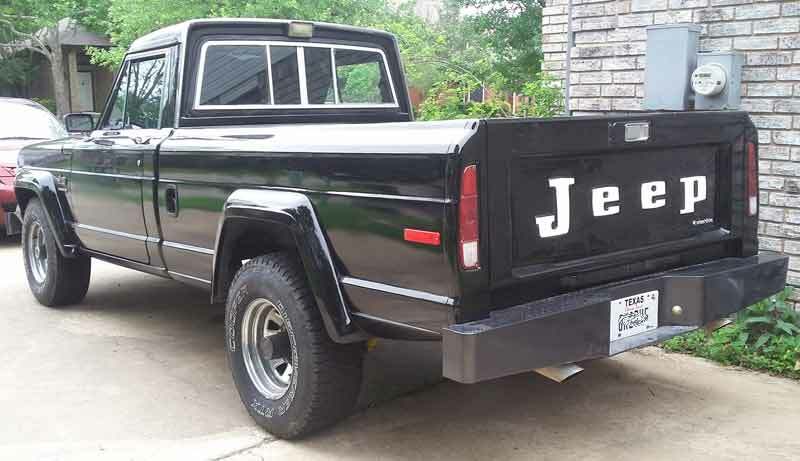 I knew that Jeep had made trucks and they are fairly uncommon. Just about everyone has a Ford, Chevy, or Dodge. But mention Jeep and many people especially those of my Millennial generation will not even know there was a such thing! 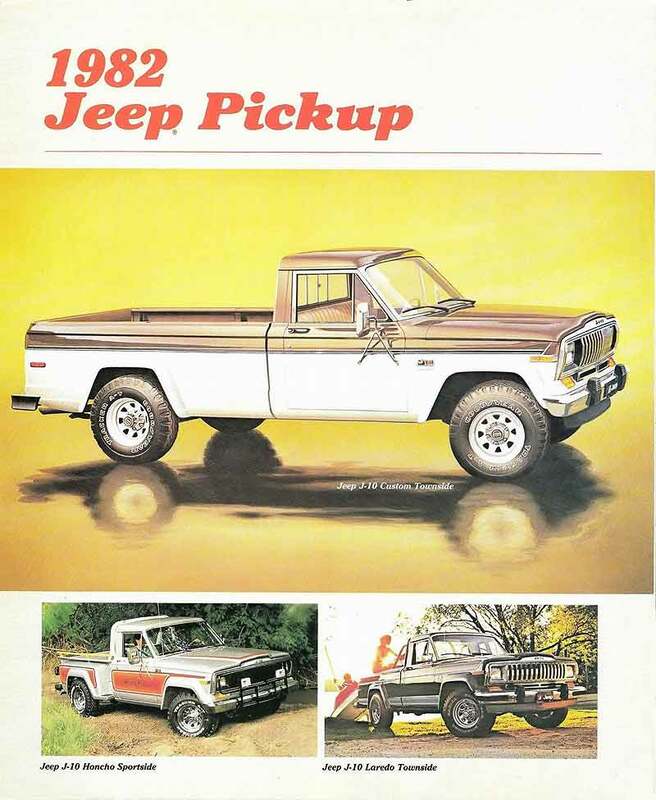 While many J-series trucks were equipped with the standard AMC 256 I6 and/or the 727 3-speed automatic transmission, I was most interested in one that came with the same AMC 360 as the Wagoneer and a 4-speed on the floor manual transmission. That combination was fairly challenging to find and the only one I found was this J10 Laredo in Dallas, Texas on December 2015. The previous owner had it for at least 20 years and originally used it as a work truck on his farm so the truck had seen its fair share of beatings. The registration tag sticker was last dated 1999. The previous owner claimed the engine was rebuilt around 1998 at about 170K miles and was driven for another 40K miles afterwards in just a year before parking the truck. I was concerned there was an issue with the engine rebuild if it was parked not long after so when asked why he parked the truck, he responded that he simply upgraded because the J10 mileage was lousy. Well, with a big honkin' V8 that is no surprise! 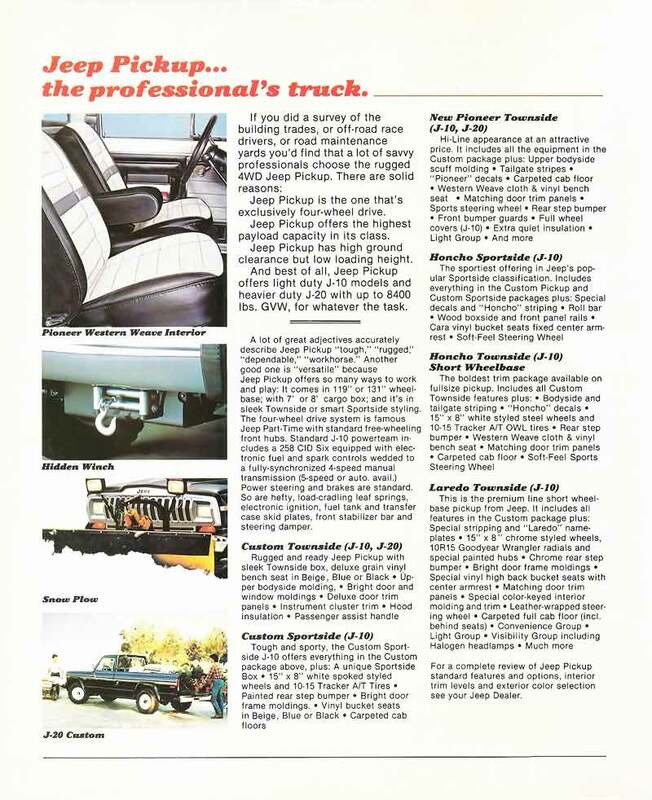 For the 1983 year, there were 3 body styles and 4 trims available. Body styles include Sportside (stepside bed) and Townside (standard bed). The Townside came with either a short 7' bed (119" SWB wheelbase) or long 8' bed (131" LWB wheelbase). Trims include Custom, Honcho, Pioneer, and Laredo. This one I have is a SWB Townside Laredo. 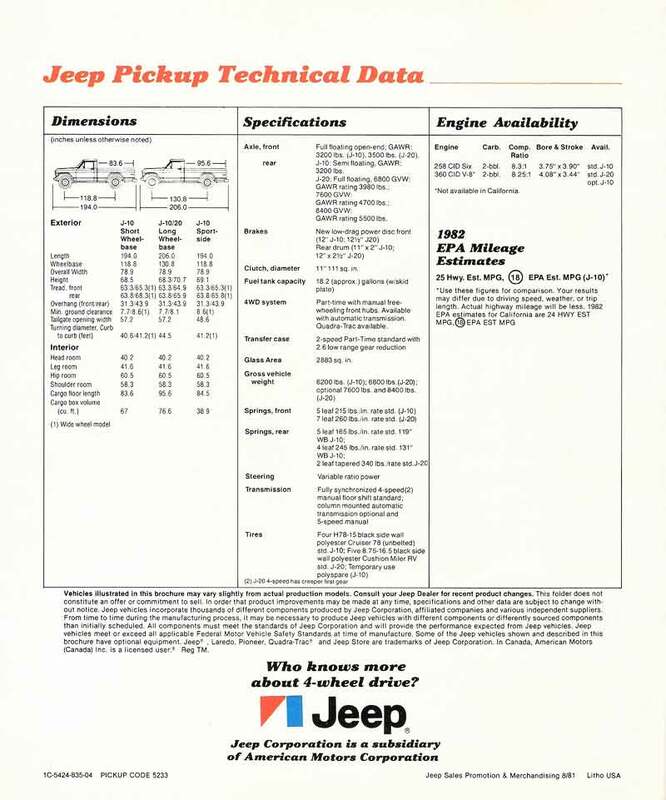 Courtesy of oldcarbrochures.com are the following brochure pages for the 1982 Jeep J10. The previous owner advertised this J10 to "run and drive" but the truck was not actually in that good of shape after having sat unused outside uncovered for 16 years. When I test drove the truck, the engine did run surprisingly well although it clearly was in dire need of a tune up. The clutch was shot and the brakes were dragging. I drove it back to my parents house 50 miles away instead of having a transportation company haul it off the previous owner's farm. In hindsight, I would never do that again. The tires were 20 years old and dry rotted. Even though the truck was driven slow the entire way, the tires were slowly deflating and caused difficulties in steering. The brakes were pulling to one side. The truck had a camper shell that made it nearly impossible to see around and navigate through Dallas traffic. Turn signals and brake lights didn't even work correctly. The electric door windows didn't even work either so there was no way to do hand signals either! But somehow with some divine intervention, the truck managed to limp along the entire 50 mile trek to my parents house and then promptly fell apart right there on their driveway. The engine refused to start again. A transport company was organized to haul the J10 down to Austin where I lived. Loading the truck on the transporter turned out to be a challenge because rolling the truck around was nearly impossible. As I later found out, the issue was not because of weight but rather all of the brakes except one had seized up from rust and lack of use! The repairs I had done to the truck involved repairing, replacing or restoring almost everything except the engine itself. The first failure that occurred after the J10 made the 50 mile trek from the previous owner's farm were all the rubber fuel lines turned into swiss cheese and leaked after being exposed to ethanol-laced gas for the first time in many years. Below are links to write ups on various topic areas. 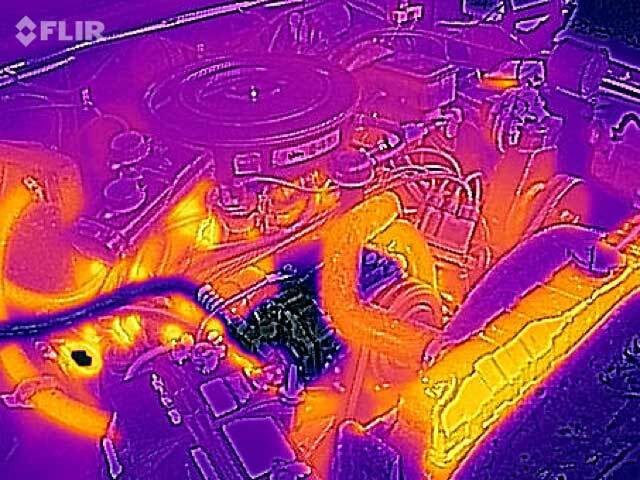 Here are some shots of the engine and a really cool thermal image taken with an IR camera that I borrowed from a friend. Notice the nice and cold A/C compressor!